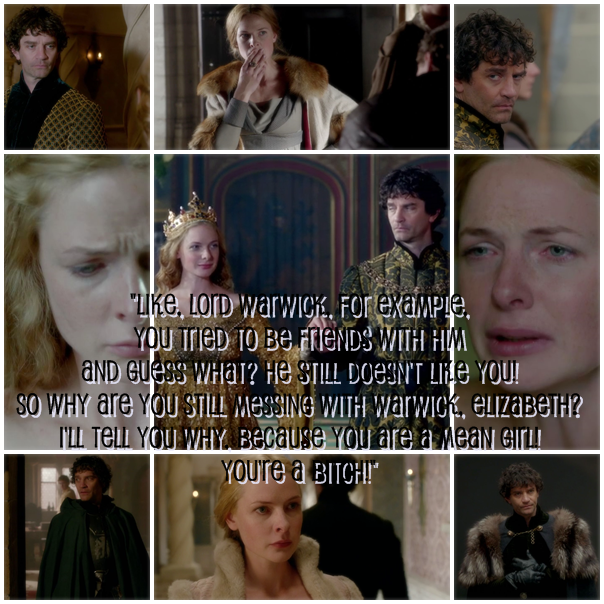 Elizabeth: Edward, Warwick hates you! Edward: No, he loves me. Warwick: No, she’s right. I hate you now. Isobel: Anne! I’ve just found out I’m a pawn! Henry VI: I could be wrong, but I think I might be Jesus. Elizabeth: I’ve just been told my father’s dead. Margaret Beaufort: My son will be king! Gloucester: Hang on, I’m pretty sure I just foreshadowed that I’ll be king. Elizabeth: I’m going to put a curse on a bunch of people. Audience. Knock yourself out. I think we’ve lost interest. This entry was posted in The War of the Roses (1455-1485) and tagged episode 2, the white queen by tudorqueen6. Bookmark the permalink.